In Revelation 7, we discovered that Elohim is waiting for the 144,000 to be sealed before the trees, sea and the earth can be “hurt.” So does it make sense that the trees, sea and earth would be hurt once the 144,000 have been sealed? We will discover how those objects are “hurt” and to what extent in Revelation 8, pictured under the sounding of the first four angels with trumpets. Revelation 8:1 should be Revelation 7:18. Men have put the chapters and verses in the Bible, and sometimes they made mistakes in dividing the wording. Revelation 8:2-5 shows what takes place in heaven and on earth just prior to the sounding of the trumpets of the first four angels and signals mankind that the “time of trouble” mentioned in Daniel 12:1 has begun. Elohim has His way of communicating with us so we can understand what is going on in heaven by attaching an event in heaven to an event occurring on the earth. The event taking place in heaven is “the angel took the [golden] censer,” standing at the “golden altar” offering up the “prayers of the saints” prior to casting the “golden censer” into the earth (Revelation 8:3-5). What is pictured here takes place in heaven and will be discussed when we come to our study on Daniel 12. At the same time on the earth, “there were voices, and thunderings, and lightnings, and an earthquake” (Revelation 8:5). This is not just any earthquake, but a global earthquake accompanied by “voices, and thunderings and lightnings.” When this earthquake occurs, we will know where we are during the last days. This event marks the beginning of the “time of trouble” mentioned in Daniel 12:1 and will arrest mankind’s attention. There are many ways by which Elohim has been trying to get our attention, but just as it is with alarm clocks, we too often hit the snooze button and turn over and fall back into our state of complacency. Unfortunately, most will not understand what is going on when this earthquake occurs. Those of you reading this book prior to that day will be able to tell them! No one can foretell the future, but Elohim challenged the false gods the children of Israel were worshipping saying “Let them bring them forth, and show us what shall happen: let them show the former things, what they be, that we may consider them, and know the latter end of them; or declare us things to come. Show the things that are to come hereafter, that we may know that ye are gods” (Isaiah 41:22-23, emphasis added). By challenging the false gods with these questions, Elohim was putting forth the claim that He could foretell the future and was the only One Who could. There are many pretenders seeking to replace Elohim! Only the true Elohim revealed in the Bible can reveal the future, which He has done for us in the books of Daniel and Revelation. “Surely Yahuwah Elohim will do nothing, but He reveals His secret unto His servants the prophets” (Amos 3:7). Elohim always gives ample warning to mankind in order for them to take the necessary precautions to avoid dire consequences. I am not giving you a new revelation I have received from Elohim; I am attempting to show you what Elohim revealed to the prophets, Daniel and John, the author of Revelation. “All the inhabitants of the world, and dwellers on the earth, see you, when He lifts up an ensign on the mountains; and when He blows a trumpet, hear you” (Isaiah 18:3). Trumpets were sounded in the Old Testament times of the Bible to give warning to the people and so it is with what we see in this chapter of Revelation. “Also I set watchmen over you, saying, Hearken to the sound of the trumpet. But they said, We will not hearken” (Jeremiah 6:17). Unfortunately much like the ancient nation of Israel, most of the world will not listen to what the trumpets are telling us before they sound. Following the global earthquake, “The seven angels which had the seven trumpets prepared themselves to sound. The first angel sounded, and there followed hail and fire mingled with blood, and they were cast upon the earth: and the third part of the trees was burnt up, and all green grass was burnt up” (Revelation 8:7, emphasis added). We have experienced forest fires and prairie fires, but nothing that has consumed a third of the trees of the earth and all the grass. What can cause such wide spread devastation? “Hail and fire mingled with blood.” John received a vision, and it was left with him to best describe it in his own words. It was not dictated to him what he should write. He was not told to clothe it in symbols, so John tells us what he saw was like hail and fire and blood. Most of us know what hail is, but this hail is different; it is on fire and red. Let me suggest that we are looking at a meteorite shower that burns a third of the trees and all the grass and many houses! Surely if the trees and grass are burning, it would be only logical that houses and maybe even cities will burn. We recently have seen a large city in Canada burning because the forest fires could not be controlled. There are houses consumed by fire on a yearly basis in California, as we saw again this past year, and in some other parts of the western USA and in other parts of the world because of forest fires. In some states houses are burned when prairie wildfires burn out of control. Surely these are harbingers (an event heralding the future) of things to come. Deciduous trees and forests would not be in the danger that evergreen forests would be, but the preceding global earthquake would limit anyone’s ability to put out such wide-spread fires; balls of fire flung to the earth, that are too large to be burnt up as they entered the earth’s atmosphere. We recently saw Gatlinburg, Tennessee which is in a deciduous forest ravaged by forest fires, but nothing wide-spread as it is in areas with evergreen forests. “And the second angel sounded, and as it were a great mountain burning with fire was cast into the sea: and the third part of the sea became blood: and the third part of the creatures which were in the sea, and had life died; and the third part of the ships were destroyed” (Revelation 8:8-9). What is being described here? Those who have been studying astronomy will know. This is how astronomers have been describing the results of an asteroid impact on an ocean. This one is pictured as a “mountain burning with fire.” I remember seeing Mt. Rainier, in the state of Washington, from a distance of 300 miles; it was unbelievable to be able to see a mountain from that distance. And this asteroid being described is as large as a mountain! 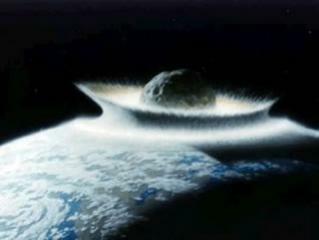 The damage pictured in Revelation 8 is consistent with a mountain-sized asteroid hitting an ocean. “The third part of the sea became blood” (Revelation 8:8). The heat from the asteroid and the impact would destroy the oxygen in the area of the ocean affected, and anaerobic bacteria (bacteria which survive with little or no oxygen) that are red would multiply rapidly, producing what is commonly known as “red tide.” “The third part of the sea became blood” (Revelation 8:8). It is my understanding that the Pacific Ocean contains one-third of the waters of the oceans of the earth, but we are not told which ocean was being hit. “And the third part of the creatures which were in the sea, and had life died” (Revelation 8:9). All creatures in the area of the ocean affected that rely on oxygen would soon perish from the lack of oxygen and the heat generated from the impact. “And the third part of the ships were destroyed” (Revelation 8:9). Scientists estimate the tsunami generated by such an event could produce a thousand-foot-high tsunami. What damage such a tsunami would do to the coastline and inland surrounding that ocean we are not told; we can only speculate. In recent years, we have seen what small tsunamis did to Thailand and Japan, but this tsunami could be as high as 1,000 feet! What we are seeing is the physical destruction caused by each of these events. The toll in human life is given in the fourth seal, pictured in Revelation 6:7-8, and we will see the human tragedy unfold there. Why is Elohim causing these things to occur? Is He? It is my understanding that Elohim has been preventing these events from occurring. Remember, pictured in Revelation 7 are four angels holding back “the four winds of the earth” from blowing on the earth causing “hurt” to the trees, earth and sea. Earth will not be destroyed, but mankind, along with the planet itself, will suffer greatly as the trees, and the earth and the sea are affected by what is shown in the first four trumpets. First, there is the ozone layer which mankind is destroying. This shield protects us from the ultraviolet rays of the sun. Second, there is the magnetic shield which protects us from the effects of the solar flares and the solar eruptions of the sun. This shield is made visible in some parts of the world and is seen as the Northern Lights. This shield pushes the winds generated by solar flares and eruptions around the globe without them harming the earth; otherwise, the surface of the earth would be wiped clean. Then there is the shield that protects us from the debris flying around in space. Is there such a shield? Consider this. The moon is continually being impacted by space debris. The moon has been charted, and new impact craters are detected when they occur. Why is the moon being impacted and not the earth which has the greater gravitational pull? The only reason is Elohim has a shield which protects planet earth from this occurring, and this is pictured in Revelation 7 as the four angels holding the four winds of earth. The earth has an atmosphere (Genesis 1:7-8) surrounding it; whereas, the moon does not, and this atmosphere burns up space debris as it enters into the atmosphere preventing major damage from occurring. Scenes are pictured throughout the trumpets which Elohim has been preventing since the fall of man over six thousand years ago. As I was writing this chapter, a meteorite exploded over Russia. If it had not broken up, we can only guess as to how large the crater would have been. There have been harbingers foretelling us what is about to happen. If we fail to read it in the Bible, then the heavens will declare what is to come (Psalm 19:1), but most fail to understand these signs for what they are. In recent years, sizeable asteroids keep showing up on the radar. Whether this is due to the technology being better today than when I was growing up or whatever the reason, mankind is being given adequate warning of what is approaching. John did his best to relate to us what he saw in this vision. If he cannot get through to us by one means, he will try another. The star [falling star – how often we refer to particles streaking through the night sky as falling stars], Wormwood is another asteroid impact, only this one impacts a land mass, and makes the rivers and aquifers bitter affecting one third of the rivers of the world. Acid rain making the water unfit for use - bitter? Unfortunately, we are not told where on earth this event will occur. I can only speculate in this matter, but where would an asteroid hit that might affect one-third of the rivers? The Himalayans are the source of many rivers throughout Asia, Southeast Asia, India, and Pakistan, and if it hit there it would not only affect the quality of water but the intense heat and the impact of the asteroid would cause horrific flooding, possibly followed by drought for those relying on those rivers which may disappear or the flow of them could be greatly altered? When pieces of space debris hit our atmosphere they usually burn up due to their small size, but occasionally, a larger piece makes it to the surface, to which craters all over the earth attest. If larger size pieces such as asteroids enter the atmosphere they would be on fire but never fully burn up because of the size of the asteroid. I still remember the asteroid that broke up into smaller pieces before it impacted the planet Jupiter. One after the other they hit Jupiter leaving their scars behind from their impacts on that planet. When the global earthquake occurs, numerous volcanoes will erupt, a third part of the trees and all the grass burning, and asteroids hitting the sea and the land, one can only imagine the amount of debris that will be injected into the atmosphere and will darken a third of the earth. We are not told for how long. Again, we have seen harbingers of these events in recent years. A number of years ago a volcano erupted in Iceland, and it shut down air traffic in Europe for two weeks. We are told in Luke 21:26, “Men’s hearts failing them for fear, and for looking after those things which are coming upon the earth.” We can read the description of what is to take place, but we cannot fully comprehend it because nothing like what is being described has ever occurred before on the earth. In 1998, a mile-wide tornado went through the town near where I lived and destroyed my home as it was passing by. I came up from the basement after it was over and saw that most of my neighbors’ homes were gone as well. I found it hard to believe what I was seeing. I was in a state of disbelief and denial. Six months later, we were in our new home and there were few scars left except for the many missing trees. People were determined to build bigger and better, and they had the resources and help to do so. But after the events described in Revelation 8 occur, no one will be able to assist anyone because nearly everyone will have been affected. I believe this series of events, just described, will be taking place during a thirty day period, which we will look at in future chapters. The odds against predicting anything like these events happening and in the order given are tremendous, but just over 1,900 years ago they were foretold in a vision given to the Apostle John on the little Isle of Patmos in the Mediterranean Sea. Elohim wanted His people and the world to know what was going to be taking place in the “last days” before they happen. A blessing is missed when we have to wait to see before we believe. People are afraid of what is described in the book of Revelation because they do not understand what is being shown. We are afraid of the unknown, but if you know what is coming, even though it is scary, we can face it knowing that Elohim is still in control in spite of what is happening around us. We can talk about what “faith” means, but do we have faith to believe what the Word of Elohim tells us before we see it happen? We tend to have to see before we believe. The Bible gives us this definition of faith: “Faith is the substance of things hoped for, the evidence of things not seen” (Hebrews 11:1, emphasis added). As bad as what has just been pictured will be, what will follow is even worse. “And I beheld, and heard an angel flying through the midst of heaven, saying with a loud voice, Woe, woe, woe to the inhabiters of the earth by reason of the other voices of the trumpet of the three angels, which are yet to sound!” (Revelation 8:13, emphasis added). It doesn’t get any better soon; but it will get better for those “that shall endure unto the end, the same shall be saved” (Matthew 24:13). What can we do to prepare for such events? There is little that we can do physically, except to not live close to the ocean and maybe stay away from evergreen forests, the prairies and large cities. During the 1930’s, a businessman in Europe could see trouble looming on the horizon and searched for a safe place to move to for himself and his family. He found a little island in the South Pacific called Guadalcanal, to which he moved with his family, thinking they would be safe from the war that was about to erupt in Europe. History buffs know that some of the worst fighting during World War II took place there. “It is not in man that walks to direct his steps” (Jeremiah 10:23). Only under the guidance and protection of Elohim Almighty can we find security during the times ahead. It is as if Psalm 91 had been written for just this time ahead of us in this earth’s history! “He that dwells in the secret place of the most High shall abide under the shadow of the Almighty. I will say of Yahuwah, He is my refuge and my fortress: my Elohim; in Him will I trust. Surely He shall deliver thee from the snare of the fowler, and from the noisome pestilence. “He shall cover thee with His feathers, and under His wings shalt thou trust: His truth shall be thy shield and buckler. Thou shalt not be afraid for the terror by night; nor for the arrow that flies by day; nor for the pestilence that walks in darkness; nor for the destruction that wastes at noonday. “A thousand shall fall at thy side, and ten thousand at thy right hand; but it shall not come nigh thee. Only with thine eyes shalt thou behold and see the reward of the wicked. “Because thou hast made Yahuwah, which is my refuge, even the most High, thy habitation; there shall no evil befall thee, neither shall any plague come nigh thy dwelling. “For He shall give His angels charge over thee, to keep thee in all thy ways. “Thou shalt tread upon the lion and adder: the young lion and the dragon shalt thou trample under feet. Because he hath set his love upon Me, therefore will I deliver him: I will set him on high, because he hath known My name. “He shall call upon Me, and I will answer him: I will be with him in trouble; I will deliver him, and honor him. With long life will I satisfy him, and show him My salvation” (Psalm 91:1-16, emphasis added). Elohim will prove Himself true to His Word to those who trust in Him and meet the conditions outlined in His Word. May we set our love upon Him, for He has promised to deliver us, if we do so (Psalm 91:14). “Remember now thy Creator in the days of thy youth, while the evil days come not, nor the years draw high, when thou shalt say, I have no pleasure in them: while the sun, or the light, or the moon, or the stars be not darkened” (Ecclesiastes 12:1-2). These are events which will take place during the sounding of the fourth trumpet. 1. What is the first trumpet and what will be affected by it? 2. What is the second trumpet and what will be affected by it? 3. What is the third trumpet and what will be affected by it? 4. What is the fourth trumpet and what will be affected by it? 5. What event will precede these first four trumpets?